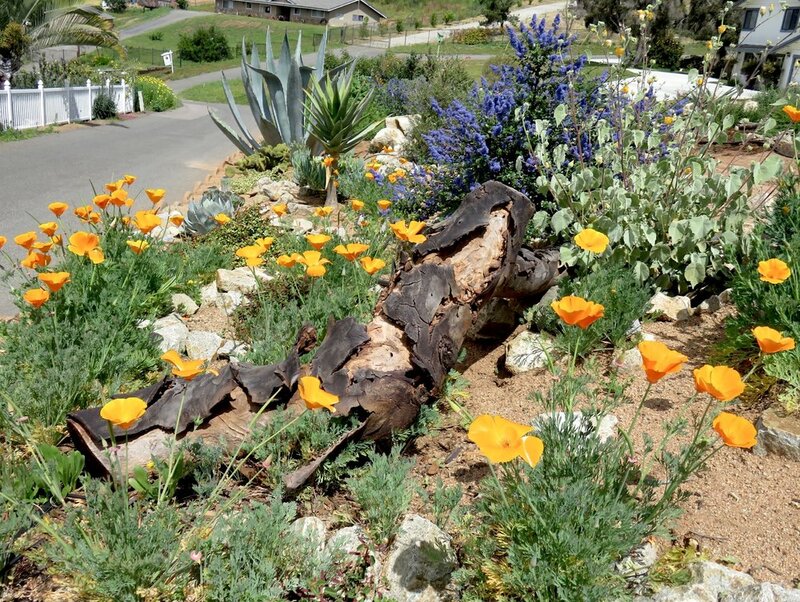 Join us on the 6th Annual CNPS Native Garden Tour that will be held in North County on Saturday & Sunday, April 14th & 15th and includes the areas of Encinitas, Cardiff, Carlsbad, Oceanside, Vista, San Marcos and Escondido. The Tour includes admission to 21 private gardens, each staffed by knowledgeable volunteer docents and homeowners. An additional 12 public and commercial gardens are available as stops on the Tour. Spend a day or two exploring some lovely neighborhoods and backcountry areas. We have a great variety of lovely gardens including features such as gardening on slopes, dry streambeds, bioswales, water catchment, charming water features, bridges, garden art, striking sculptures and more. 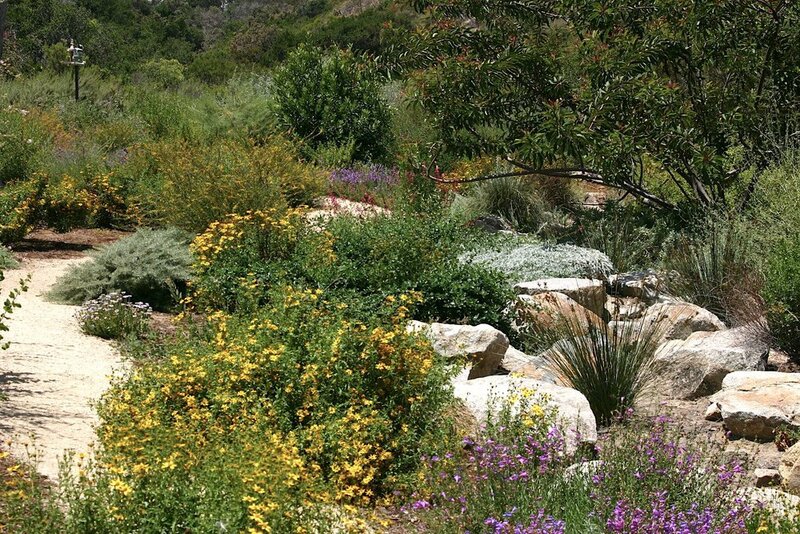 Tour these gardens while keeping in mind the concept of native plant benefits and learn more about their great value and importance in being sustainable. If we take care of our environment, it takes care of us. And we can start to accomplish this right in our own backyard! Get inspired. See what’s out there, take in unique plantings, garden art, tranquility and lots of beauty. As an additional bonus, we are featuring Sky Mountain Permaculture, a seven acre post-fire water harvesting demonstration site. The property showcases many permaculture features, including bioswales, other water harvesting examples, an earthen dome, a food forest zone, a shade structure created by a repurposed satellite dish, a babbling brook near a reclaimed wood bench sitting circle and more. You can participate in a one hour tour either on Saturday or Sunday in the morning or afternoon. This special opportunity will be an additional $10. The Sky Mountain Guided Tour is ONLY available if you purchase a Garden Tour ticket. Tickets will be available in advance of the tour and will likely sell out quickly, so if you want to participate in this great learning opportunity and adventure, buy your tickets early. Garden Tour Online: $30 (children under 18 admitted for free) on sale until Noon on Sunday. 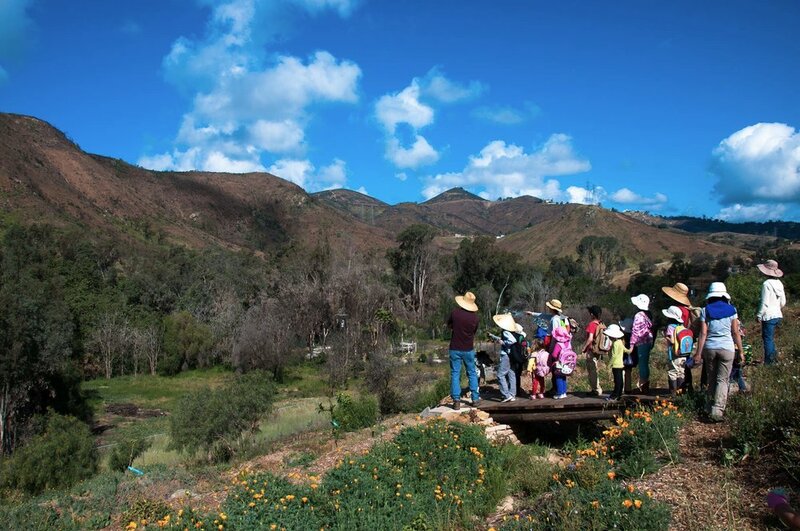 Sky Mountain Permaculture Guided Tour: $10 additional per ticket, buy for time and date (Saturday 11am & 1:30pm, Sunday 11am & 1:30pm), choose time and date carefully since these can not be switched to another time and date. The Sky Mountain Guided Tour is ONLY available if you purchase a Garden Tour ticket. Sky Mountain tickets will be on a will call list for check in at the Sky Mountain garden. On tour days, remaining Sky Mountain tickets will only be available online. Details may change without notice. This is a rain or shine event. Tickets are not refundable but are transferable to another person.